Underground, line 9, Trocadéro Station or Line 6, Bir-HakeimStation-RER C, Champ de Mars Station. Walking access by Iéna Bridge or by Bir-HakeimBridge. 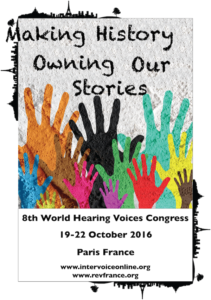 Intervoice is a charity that supports the International Hearing Voices Movement. During the Intervoice Day, we will have the opportunity to come together, as members of this movement, to share experiences, hear about new initiatives, discuss challenges and think about the where we want to go in the future. When you register for these two days, you are presented with the opportunity to live through a 7-workshops-journey exclusively designed for you! and other members of the Hearing Voices Networks! Feel the need to express a story that changed your life (for the better or the worse)? Please take advantage of our optional individualized workshop where our two facilitators, Xavier & Yann, will be at your service, finding together the best way to express and share that story with the world. Lucy Johnstone: Is There a Good Use of Psychiatric Diagnoses? HEALING VOICES is a new feature-length documentary which explores the experiences commonly labeled as “psychosis” or “mental illness” through the real-life stories of individuals working to overcome extreme mental states, and integrate these experiences into their lives in meaningful ways.